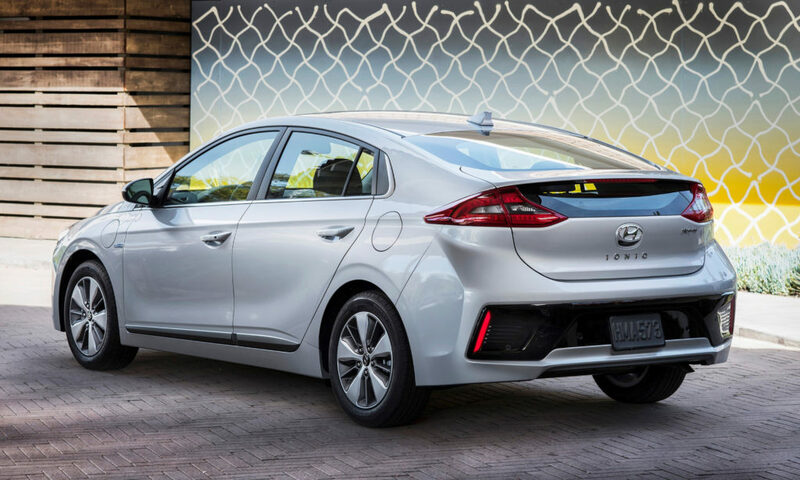 The Hyundai Ioniq PHEV is the latest member of Hyundai’s Ioniq family of fuel-efficient, low- to zero-emission compact hatchback sedans. TheCreenCarGuy previously reviewed the plug in hybrid’s siblings, the Ioniq Hybrid (conventional – no plug) and the Ioniq EV, and found each to be a worthy contender in their segments. Except as a value proposition, though, the 2018 Ioniq PHEV, doesn’t quite top the plug in hybrid category. At a base price of $25,835 including destination and delivery, the Ioniq PHEV is thousands of dollars cheaper than other small plug in hybrid sedans and hatchbacks, including the base Prius Prime plug-in – it’s chief competition. But acceleration is lukewarm and fuel economy falls slightly below the Prius Prime’s class-leading efficiency. That robs the Ioniq PHEV of some of the sparkle that helps the EV and conventional hybrid models stand out. It is best suited for those whose daily slog includes lots of city driving. That’s where the PHEV’s larger battery and extended electric-only range come into play. 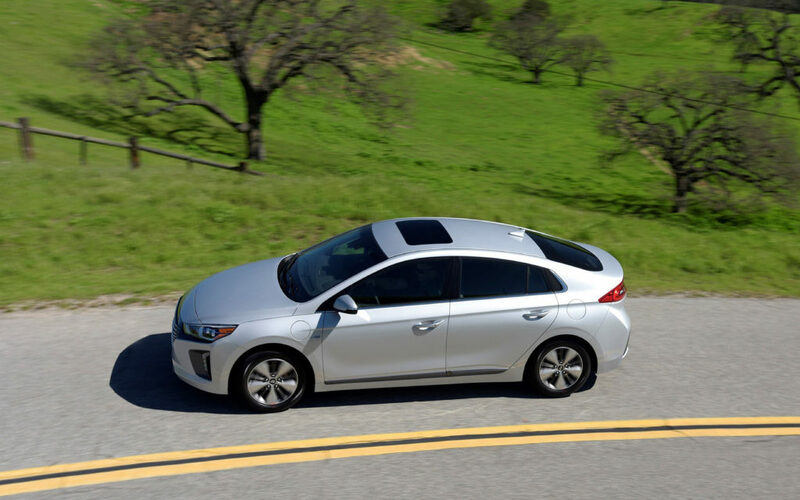 Otherwise, its 54-mpg rating for hybrid-only driving, while impressive, can’t beat the standard Ioniq Hybrid’s 58-mpg rating. For many, the PHEV’s nearly $1,000 price premium over the comparable equipped Ioniq standard hybrid model may not be justified. The Ioniq PHEV’s well-furnished interior, competent driving dynamics and long list of standard equipment, coupled with its pricing, make it a plug-in hybrid worth considering, though. The Ioniq Plug In Hybrid is available in two trim levels. The base PHEV starts at $25,835 and the Limited starts at $29,185. The Limited with Ultimate Package starts at $32,935. The Ioniq PHEV qualifies for a federal tax credit of up to $4,543, as well as for various state and local credits and rebates. The EPA has rated the Hyundai Ioniq PHEV at up to 29 miles of all-electric range, 52 mpg when operating in standard hybrid mode and up to 123 mpg-equivalent when starting out with a fully charged battery and blending EV and hybrid modes. If you don’t mash the pedal to the floor the Ioniq PHEV’s electric drive system can propel the car to about 75 mph before the gas engine kicks in. Judicious application of the accelerator pedal also can help you eke out a decent amount of all-electric range, although we never quite got the 29 miles that the EPA estimates. Out best effort achieved 24 miles of all-electric driving. The Ioniq PHEV’s battery can be recharged in about 2.5 hours with a Level 2, 240-volt home charging system. On a standard 120-volt household circuit, or Level 1 charging, the Ioniq PHEV can take 9 hours to charge. The Hyundai Ioniq is a new platform as has not yet been safety-tested by U.S. regulators. Based on its own tests and computer simulations, Hyundai expects it to receive the top federal rating of 5 stars. 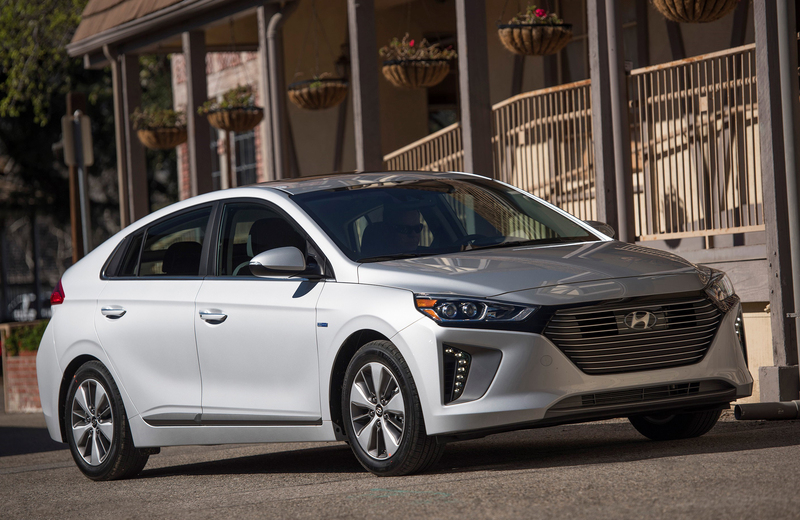 The almost identical 2018 Ioniq Hybrid was named a “Top Pick” by the Insurance Institute for Highway Safety. Both Ioniq PHEV trim levels have a pretty full slate of safety equipment. You have to go to the the Limited with Ultimate package, though, to get some of the newest systems including lane keeping assist, smart cruise control and automatic emergency braking with pedestrian detection. The Ioniq plug in hybrid is powered by the same system as the standard hybrid model, with the exception of its larger battery (8.9 kWh vs the standard hybrid’s 1.6 kWh), and more powerful electric motor (60 hp vs 45 hp). The gas engine is a four-cylinder, 1.6-liter, direct injection engine rated at 104 horsepower and 109 lb.-ft. of torque. It is mated to a 6-speed, dual clutch automatic transmission. The Ioniq PHEV’s 45-kilowatt, 60-horsepower electric motor drawing power from an 8.9 kWh lithium-ion battery pack is the heart of the Hyundai PHEV drive system. Maximum output for the Ioniq Plug In Hybrid, with gas engine and electric motor working together, is 139 horsepower and 195 lb-ft of torque. That’s the same as reported for the standard hybrid version. Standard equipment on the base 2018 Ioniq Plug in Hybrid model includes 16-inch alloy wheels, anti-lock brakes, brake assist with pedestrian detection, traction and stability control, front and rear side- curtain and driver’s knee airbags, active grille shutters, automatic headlamps, LED daytime running lights and taillights, heated power side mirrors, 4.2-inch LCD instrument and PHEV system information display, tilting and telescoping leather-wrapped steering wheel with integrated audio and cruise control, heated power side mirrors, auto up/down driver’s window, door handle approach lights, keyless entry, push-button start, a six-way adjustable manual driver’s seat, 60/40 split rear seats, cloth upholstery, heated front seats, dual-zone automatic climate control and satellite audio with 7-inch color touchscreen, USB, iPod and auxiliary jacks, Bluetooth, Apple CarPlay and Android Auto smartphone connectivity. The Ioniq PHEV Limited trim adds a 7-inch LCD instrument cluster, blind spot detection with rear cross-traffic alert, turn signals in side mirrors, 10-way power driver’s seat with two memory settings, leather upholstery, rear-cabin air vents, chrome window and interior door handle trim and an automatic up/down front passenger-side window. The Ultimate package (available only with Limited trim, for an additional $3,750) adds the active safety suite of automatic emergency braking, smart cruise control and a lane departure warning system, rear parking sensors, HID headlights with dynamic curve-following, a power sunroof, an 8-speaker Infinity audio system with 8-inch touchscreen and navigation, Qi wireless device charging, 17-inch alloy wheels and tires, an auto-dimming rearview mirror with HomeLink and compass, LED interior lighting, and Hyundai Blue Link telematics. The Hyundai Ioniq PHEV is a hatchback with a cargo area (rear seats folded down) rated at 23 cubic feet. The cargo floor isn’t completely flat with rear seats folded, and the sloping roofline limits the height of things than can be carried. But for most uses the Ioniq’s cargo space, rear seats up or down, will be more than adequate – and it is larger than what’s found in many competing small hybrids and plug in vehicles. With a generous 96.2 cubic foot passenger cabin, the Ioniq PHEV beats most competition in roominess. It’s a compact on the outside, but inside the look and feel is more mid-size. Hyundai accomplished this in part by making the Ioniq wider than most of the competition. It is almost 2.5 inches wider than the Prius, 2 inches wider than the Nissan Leaf and Chevrolet Bolt, half an inch wider than the Chevy Volt and just 0.3 inches narrower than the Ford C-Max. The result is a car with plenty of elbow room, and loads of front-legroom. 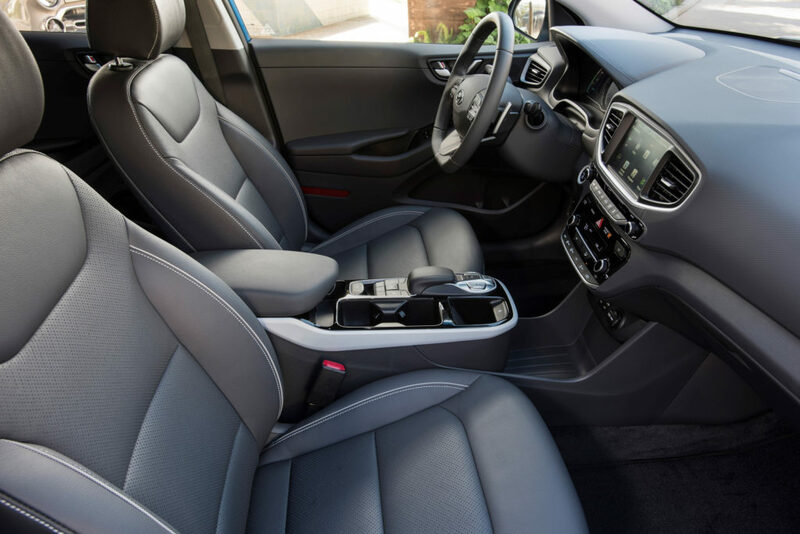 The back seats are spacious for two if a bit tight for three, but legroom is cramped if the driver or front passenger seats are pushed way back. Headroom in the rear, as with most sloping-roofed hatchbacks, can be a bit tight for the tallest passengers. The seats are comfortable and supportive. The Hyundai Ioniq PHEV, like its siblings, is fairly peppy and well-mannered, with taut, responsive steering that gets even tighter in sport mode, and decent road-holding ability. Suspension tuning is biased toward comfort, though. As a result the Ioniq Plug In Hybrid felt a bit bouncy on washboard stretches of road and displayed a bit of body roll on corners. The Ioniq PHEV’s Hybrid’s six-speed transmission and extra torque provided by the electric motor make the most of its humble 139 horsepower. It is not quickest gas-electric car off the line but it offers impressive hill climbing ability, is agile through the curves and has decent passing power in the 50-70 mpg range. The Plug In Hybrid’s transmission operates in both fully automatic and auto-manual modes. Ioniq PHEV drivers can also select among Eco, Normal and Sport modes for increased fuel efficiency or sportier performance. In any mode, power starts fading around the 60-mph mark. A pair of steering-wheel paddle “shifters” let the driver order up and switch among any of four levels of regenerative braking force. At peak Level 4, the regenerative braking function enables the car in many situations to come to an almost complete stop without use of the manual brakes. Overall, the Hyundai Ioniq PHEV should stand up well against competitors, and it outstrips all but the Prius Prime PHEV if fuel efficiency is your primary focus.